It's always good news when a picky toddler declares he's hungry, but that joy soon turns to consternation as this freckly little redhead turns up his persnickety little snub nose at a variety of foods--wrinkly raisins, squishy tomatoes, fruity fresh fruits, and an undeniably fishy whole fish, eyeballs, scales, and all. Nothing pleases this little food critic, from the sublime (spicy pizza) to the ridiculous (slimy snails). Soda pop is too "burpy," carrots are too "crunchy," and on and on through a progressively absurd selection--freezy peas in a block right out of the freezer, and stringy spaghetti which wraps up the tot like a mummy. A bowl of eyeball and octopus soup is, predictably, "PEE-YOOEY!" Will this kid NEVER eat again? As in her companion piece featuring a fashion-conscious little girl, Too Purpley! 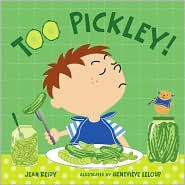 (Bloomsbury, 2010), (reviewed here) Reidy reinforces the common wisdom that dealing with this irritating but inevitable self-assertive stage of preschool development is best met with a sense of humor. Again illustrator Genevieve Leloup's deft use of super-saturated watercolors and backgrounds backup Reidy's bouncy rhyming text to make feeling finicky about as much fun as it's ever gonna be.